There’s a rank in art that is never officially assigned, but emerges slowly, over time, like a submarine filmed in super slo-mo. Very few artists get to hold this rank. During my watch as a critic, only four have risen to it: Henry Moore, Francis Bacon, Lucian Freud and, now, Frank Auerbach. It’s the rank of Britain’s greatest living artist. No one pins a badge on you to say that is what you have become. It’s just something that gets agreed on. Critics suggest it first. Art admirers begin repeating it. Finally, the auction houses get round to proving it with their absurd price jumps, a point reached in July this year when someone at Sotheby’s forked out £2.2m for Auerbach’s drawing of his cousin Gerda Boehm, an Auerbach record for a work on paper. To become BGLA, it is not enough to be popular or famous. There is also the tricky business of depth. David Hockney, for instance, whose work has long been more prominent than Auerbach’s, and whose prices have long been higher, is a perpetually interesting artist who will never become BGLA because his art sweats the small stuff, not the big stuff. To be a BGLA, you need to address humanity. 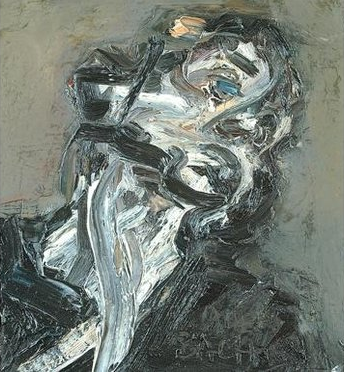 And Auerbach, who is now the subject of a compelling tribute at Tate Britain, appears always to be doing that. The show isn’t quite a retrospective, but it does include works from 1953 to the present, and they are mostly arranged chronologically, so it functions well enough as one. 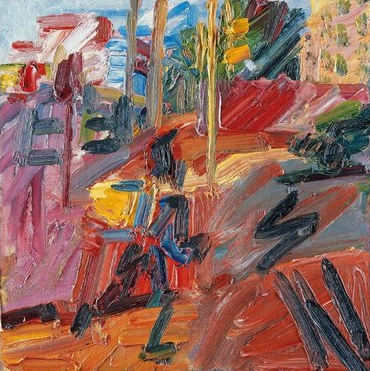 Born in Berlin in 1931, Auerbach is one of the last surviving artists for whom the Second World War is a meaningful memory. I mention it here only because notions of destruction and rebuilding are central to what he does, and because there is something about the way he uses the same models, year after year, decade after decade, that seems to speak of rootlessness and reliability. When your world has been turned upside down, as Auerbach’s was when his parents sent him to safety in England in 1939 — he never saw them again — you need and notice fixed points in the destruction. To sense what his early world was like, glance at the show’s oldest image: Building Site, Earl’s Court Road, Winter, from 1953. Almost completely black, smeared with clods of dark oil paint that look as if they’ve been scraped off the soles of a builder’s boots, it’s a slab of pessimism so unlit and heavy that you have to take its maker’s word for what it depicts. You can’t actually see the building site. You can only feel it. The journey made by the show ahead can broadly be described as a journey from darkness into light. Certainly, by the time we reach the most recent paintings, six rooms later, the colours have brightened and the moods have softened. Yet Auerbach’s art never becomes carefree. The bleakness, the struggle, the labour of that first building site never disappear entirely from his output. As this mighty show progresses, a black caterpillar turns into a brightly coloured caterpillar. But it never turns into a butterfly. His first manner involved working with spectacular quantities of oil paint. Starting a new layer every day, he’d arrive, many weeks and several inches later, at the image he was seeking. Nominally, these are paintings, but they share their weight with sculpture, and feel like accumulations of wax from an undertaker’s candle. A pair of fabulous heads created with this method, one of the painter Leon Kossoff, the other of Auerbach’s favourite model, known by her initials, EOW, stare across at each other like the tiny heads of two dumb dinosaurs. The amount of accumulated paint it has taken to make them gives them a presence that seems primitive and ancient. Also hanging in the first room are two more realistic portraits, done in charcoal: one of Auerbach himself, from 1958, and the other of EOW again, this time recognisable as a heavily browed woman with a small face. The inclusion of these recognisable portraits clarifies what Auerbach was seeking in the blobby versions — a telling perimeter, a sculptural outline. If they were boats, they’d be encrusted so thickly with barnacles, you’d hardly make them out. EOW, who turned out to be Estella Olive West, Auerbach’s landlady and lover, appears again in a couple of powerful nudes that signal the appearance of brighter colours in his art, and of a stirring, tangible, problematic sexuality. In one picture, she’s huddled on a bed. In another, she’s a naked half-length with formidable breasts that catch the light. Exactly like his predecessor Walter Sickert, into whose area Auerbach moved in 1953, when he took a studio in Mornington Crescent — minutes away from where Sickert painted the Camden Town Murder series — there’s a darkness to Auerbach’s take on female nakedness, an essential gloominess, as if joy and need were incompatible. I dwell on these opening rooms because they are intended as agenda-setters. Auerbach himself chose the works and their sequence. The studio into which he moved in 1953 is the studio in which he still works, every day, 365 days a year, no holidays, no collector’s yachts, none of the usual useless trappings of contemporary art success, just an unshakeable daily determination to spot the ship in the barnacles. Since the 1950s, he has only painted two things: his loyal models and the surroundings of his studio. The show divides the journey into decades, with every decade getting a room to itself. The 1960s turn out to have been his least assured era. Forced to give up the thick accumulations he’d pioneered in the room before — it really was a ridiculous way to make pictures; oil paints can take 100 years to dry — he began scraping down the daily failures, instead of painting on top of them, and starting again till the result was right. It’s a method that led initially to some clunky moments. With their LS Lowry blacks and their Camden council yellows, the angsty Londonscapes of the 1960s are the only works in the show that fail to transcend their times. Interestingly, it is in the first paintings of the parks near Mornington Crescent that things start going right again. The extra space available in Primrose Hill and Hampstead Heath becomes somewhere to practise the bold zigzags that start flashing through his art, bringing a sense of weather and movement to the cityscapes. 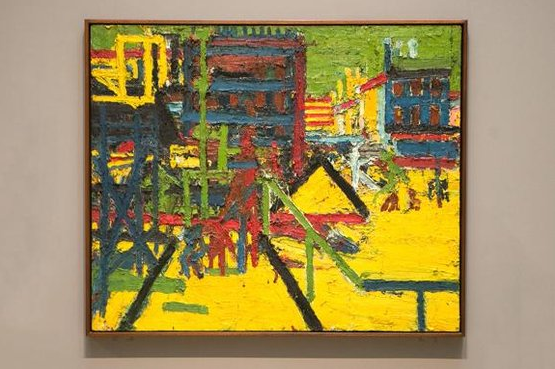 In the next three rooms — the 1970s, 1980s, 1990s — Auerbach the city painter goes from strength to strength. His pictures of people have no such dips. When EOW stopped posing for him, in 1973, she was replaced by a group of loyal sitters who sit to this day. The art critic William Feaver is one of them. This exhibition’s curator, Catherine Lampert, is another. I know them both. Neither is recognisable in these renditions of them. Sorry, Bill and Catherine, but both of you are merely excuses for displays of exciting paintwork that searches constantly for the briefest and most surprising journey it can take to evoke a sight. These are the kind of marks that a fencer might make if asked to draw portraits in the air with an epee. The result is something exceptionally rare and exceptionally difficult: a new way of painting.